Health and Happiness - it doesn't need to be both, it could be health or happiness. But I think they are fitting things to be thinking about in what is still a brand new year, don't you? The design team has come up with a few designs which I love - hope you do too! If you'd like to join in this week, you can find more information on the papercraft challenge page, but it's pretty simple - the main thing is, just leave your blog link below - we'd love to visit you and see what you made! Well done to you both! You both win three digistamps of your choice from the Handmade Harbour store. Please pick your stamps and email wendy@handmadeharbour.co.uk with your choices. I'll then get them to you as soon as possible. OK, are you ready? I love this first one! 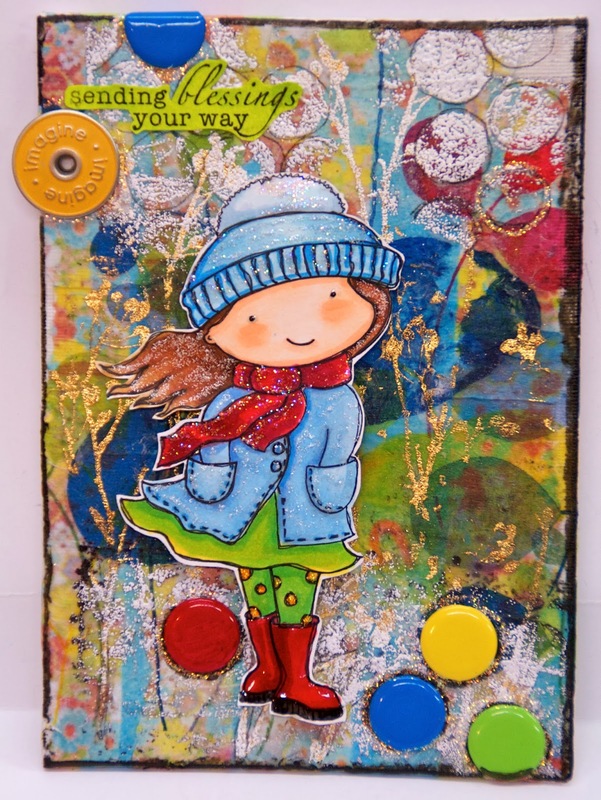 Lynne made a 5" x 7" canvas with the brand new girl in windy weather digistamp - this canvas would look fabulous hanging on the wall! It took my breath away when I saw it - I adore all the colour and feeling of excitement in this one! Rachel plumped for the popular wine o' clock digital stamp to make her gorgeous card. Of course, red wine is supposed to be good for you (in moderation!) and the feel-good factor of a little tipple certainly fulfills the happiness part of this challenge! I think you could add in the smile that this card will raise! What have you been making that might fit our health and happiness theme? Or perhaps you want to make something especially for the theme? There are two winners every week, and remember that if you use a Handmade Harbour digital stamp in your project you significantly increase your chances of winning! To join in, please leave your link below - and it would be lovely if you could visit a few of the other entrants and leave some comment love - this is a party, after all! !